Los Santos Motorcycle Club and Valley Fever team up to bring you another all day Country Music Fest with all your favorite local country bands and musicians! 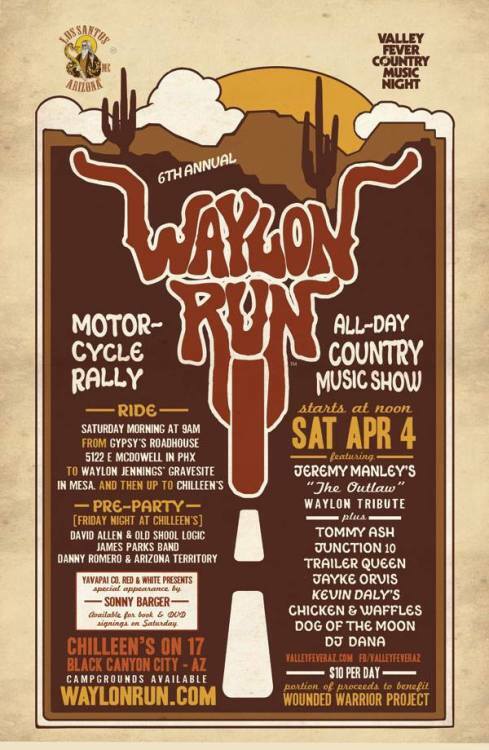 Valley Fever is presenting the Saturday April 4th All Day showcase featuring Jeremy Manley’s Waylon Tribute, Dog of the Moon, Kevin Daly’s Chicken & Waffles, Tommy Ash, Trailer Queen, Jayke Orvis, and the mighty Junction 10. Plus Dana’s old country records between sets. The show starts at noon! Saturday morning we will be rallying at Gypsys Road House at 9:00 am (kickstands up at 10:00 am) and then riding to Waylon’s grave site. After that we’ll ride up to Chilleen’s on 17 to the music fest. Feel free to bring your camping gear if you wanna camp, it’s free! Beats worrying about drinking and driving home. NOTE: This year we are also having a PRE PARTY Friday night on April 3rd at Chilleens on 17 starting at 7:00pm where James Parks and a couple other bands will be playing. This is for those folks who wanna get the party started early, or if you’re coming in from out of town and want a free place to camp. And for whoever decides to camp out Saturday night we’ll be doing a hangover ride to the Chill Grill like we did last year for breakfast. $10.00 cover. Food and Drink Specials.